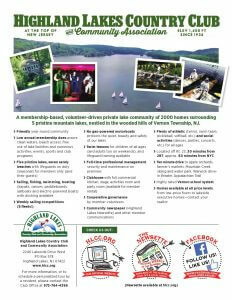 Highland Lakes Country Club and Community Association – Check Us Out! Highland Lakes Country Club and Community Association is a private lake community comprised of five lakes, seven beaches, a Clubhouse, and recreational facilities including ball fields, tennis and basketball courts, picnic areas and playgrounds… all on roughly two square miles of land roughly 1,200 feet above sea level. Sailing and boating are enjoyed by many, along with swimming, hiking, fishing, and kayaking. There are sailing leagues, swim teams, tennis leagues and a variety of recreational and social activities held at the Clubhouse. The Club supplies docks and boat racks for members located throughout the community. Volunteerism is a big part of the lifestyle in Highland Lakes. 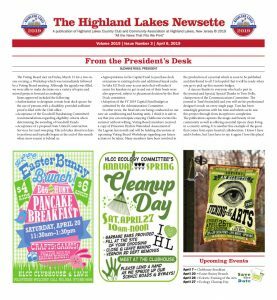 Many of the athletics, social and recreational activities of Highland Lakes are planned, organized and directed by the dedicated junior and adult volunteers of Highland Lakes. Each summer, our volunteers are honored at Junior Appreciation and Adult Appreciation events. Volunteers make our Highland Lakes so special. There are approximately 1,975 private homes and 230 vacant lots that comprise the 2,200 members of Highland Lakes. The Club is governed by an elected, 17-member Voting Board and various committees including Roads, Ecology, Planning, Athletics, etc. The Club’s members are further governed by By-Laws and Rules and Regulations. The General Manager is supported by a year-round administrative, maintenance and security staff. The employee roster grows significantly during the summer months as lifeguards and recreational aides join the staff. All new owners of property in Highland Lakes, at the time title to property is acquired, are obligated to the Club for the payment of a $2,000.00 Initiation Fee Always check with the Club Office before changing the ownership of property in order to determine whether an Initiation Fee will become due. It is important to understand what is meant by a change in ownership. Most times, we think of a typical real estate transaction where there is a buyer and seller, but there are many other real estate transactions that give rise to an Initiation Fee assessment. If an owner changes the ownership of a property, for example when a spouse joins with the current owner through a new deed caused by refinancing a mortgage, or joins in the ownership of other properties with someone who was not an owner in Highland Lakes at that time, or when a transfer is made from a business name to individual name(s) or vice versa, an Initiation Fee also becomes due. Many people follow the advice of professional financial advisors and create a trust for estate planning and other purposes, and one of the financial transactions involved in creating the trust may include transferring title to the property they own into the trust. These trusts are distinct legal persons and are required to obtain taxpayer identification numbers from the Internal Revenue Service. When this occurs, an Initiation Fee is assessed to the trust as a new owner of property in Highland Lakes. Other examples of real estate transfers that result in Initiation Fees being assessed include, when parents add their children as owners of their Highland Lakes property, or when they transfer ownership of their property to their children. It is not practical or even possible to identify all of the real estate transfers that give rise to the assessment of the Initiation Fee. Therefore, in order to determine when an Initiation Fee will become due, it is always best to consult with your attorney and to check with the Club Office before changing the ownership of the property. Members are also obligated to the Club for the payment of the annual dues and assessments that are charged for every house and vacant lot in Highland Lakes. For those who own a home, payment of the annual dues and assessments entitles members to all of the privileges of membership, including membership badges and boating, docking and parking permits for owners and those residing in the household. There is an additional charge for membership badges and permits for lot owners. Guest badges are available for purchase by members for $1.00 per day for their guests to use the Club’s beaches and recreational facilities. The annual dues also provides for the maintenance and snow plowing of the Club’s 32-mile network of private roads, insurance, real estate taxes, maintenance of Club facilities, utilities, security patrol, lake and dam management, lifeguards and swim lessons, fish stocking, etc. Prospective purchasers are cautioned that certain vacant lots are situated on “paper” or “unimproved” private roads in the Highland Lakes community. Development of these properties is subject to the Club’s Road Design and Construction Standards that require owners of properties located on any unimproved road to, at the time any dwelling is constructed on the property, cause such road to be improved according to those Standards so as to give the dwelling access to an existing improved road. Before entering into any contract to purchase a vacant lot, please contact the Club Office to determine whether development of the vacant lot is subject to the Road Standards. In addition to the Club’s standards, the development of a vacant lot is subject to ordinances of Vernon Township, well and septic requirements of the Sussex County Department of Health, and certain regulations of the State of New Jersey, all of which should be consulted before purchasing. Prospective purchasers are strongly cautioned that, before they close title on a property in Highland Lakes, a report on the status of outstanding dues and assessments should be obtained from the Club by their attorney or title company. This report discloses to prospective purchasers whether the sellers have met all of their obligations to the Club by the payment of the Club’s dues and assessments. The attorney or title company, working on behalf of the purchasers, should ensure that the sellers are members in good standing and all amounts due the Club have been paid in full. Otherwise, purchasers are not entitled to any of the privileges of membership if the sellers are delinquent in their dues and assessments, and the unpaid charges constitute a continuing lien on the property. There is no substitute for obtaining a Status Report prior to closing. Consult the current Dues and Assessments Schedule for the amount of the Status Report fee. All purchasers are advised that the Club is vested with the authority under its By-Laws to guard against all trespasses onto Club property. As the roads are owned by the Club, and the width of the right of way of the Club’s roads generally exceeds that of the actual road bed, Club Rules state that no obstruction shall be placed, nor structures built, beyond any individual property line so as to extend into the right of way. In addition, the Club owns many individual lots abutting member properties. Purchasers are urged to obtain a survey before the proposed transfer, and to carefully review their survey for encroachments prior to closing. The Club will require the removal of any encroachment onto its property, and will reserve the right to be compensated for the costs of such removal and litigation associated with any encroachment. Please note that even though the property address that you are considering purchasing may state “Highland Lakes,” there are many properties located within the Highland Lakes zip code of 07422 that are located in other communities, such as the Barry Lakes or Lake Wanda neighborhoods of Vernon Township. You, your attorney or title company should confirm that the property you are purchasing is located within the private community of Highland Lakes. Feel free to make a simple telephone call to the Club Office to confirm the property’s location. 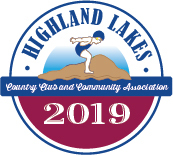 We look forward to your interest in Highland Lakes Country Club and Community Association. It is a superior place to live. The request for a Status Report must be made in writing and be accompanied by the Status Report preparation fee as set forth in the Dues and Assessments Schedule for the current year (see the At A Glance section on the right hand side of this page). Please anticipate a processing time of seven business days so the report should be ordered well in in advance of the scheduled closing. Please contact the Club Office at 973.764.4366 for more information.